Dr. Eugene (Gene) Tempel is a national philanthropic leader who holds a position of trust and has a close working relationship with the formal philanthropic infrastructure that serves the state of Michigan. Over the course of his career, he has been a successful practitioner working in the field of philanthropy, and a thoughtful researcher/philosopher about the field. He has worked with, and observed, the activities in Michigan for many years. His insights, which are based on his knowledge of the field and his many roles as a “participant with and an observer of” the work in Michigan, are included in the analysis of Our State of Generosity. 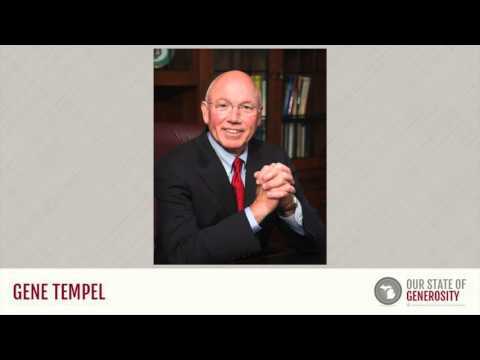 Dr. Gene Tempel talks about his career in philanthropy. Dr. Gene Tempel talks about the remarkable leadership of Dottie Johnson and Russ Mawby. Dr. Gene Tempel talks about Michigan and Indiana's involvement in projects like Learning to Give, Campus Compact, and the community foundation movement. Dr. Gene Tempel talks about how Michigan is a national leader in philanthropy. Dr. Gene Tempel talks about how infrastructure impacts the next generation of philanthropic leaders and our democratic society. Dr. Gene Tempel talks about how people in Michigan and Indiana care deeply about the field and wish to see philanthropy thrive. Dr. Gene Tempel received his Bachelor of Arts in English from St. Benedict College in 1970. He earned his Master of Arts in English from Indiana University in 1974. Dr. Tempel was awarded his Doctor of Philosophy degree in higher education administration from Indiana University in 1985. Dr. Tempel’s first experience with organized philanthropy came at the age of 26 as a school administrator at Three Rivers Community College in Missouri. Dr. Tempel’s early job responsibilities included working with local constituents to raise money for a new school building. During this project, Dr. Tempel became increasingly fascinated with understanding the motivations of donors and volunteers. “When I began working with those people on raising money,” said Dr. Tempel, “it really caused me to start thinking about why were people doing this — that is, raising the money? What motivated them to get together every Friday at noon and report to each other on how much they’ve gotten together? What was motivating the people on the other side to actually give the gifts?” His interest continued throughout his career, as he sought to deepen his knowledge of philanthropic motivation while serving in the positions described in the following sections. Perhaps the keystone of Dr. Tempel’s long career within the philanthropic sector has been his role in establishing and leading the Center on Philanthropy at Indiana University. Three men were integral in launching this leading academic center: Hank Rosso, founder of The Fund Raising School®; Charles Johnson, former vice president of development for the Lilly Endowment; and Dr. Tempel, who was then vice president of external affairs for Indiana University (IU). The idea for the center was prompted initially by Mr. Rosso’s desire for the The Fund Raising School® to move into a university home upon his retirement. Dr. Tempel and Mr. Rosso then discussed, “… the possibility that a university could not only house The Fund Raising School®, but could then begin formal study and do research around topics related to philanthropy, fundraising, the nonprofit sector, etcetera.” Dr. Tempel had always been passionate about how research could inform practice, and how practice could inform research. The idea for a new “center on philanthropy” at IU, with The Fund Raising School® as its cornerstone, fit this vision for connecting research, education, and practice. Dr. Tempel engaged Mr. Johnson in conversations about the vision for a center, and they brought on as a consultant, Robert Payton, a national leader in the emerging field of philanthropic studies. Working from Payton’s broad definition of philanthropy to include giving and volunteering as well as nonprofit organizations, they developed an ambitious plan for a comprehensive academic center that would improve both the understanding and the practice of philanthropy, both inside and outside the academy. The plan was supported by a $4.1 million, two-year initial grant from the Lilly Endowment in 1987. Mr. Payton was hired as executive director of the center in 1988, and Dr. Tempel then served as executive director from 1997 through 2008, which were years of major growth in the center’s activities. Under Dr. Tempel’s guidance, the center became a leading national force within the philanthropic sector, promoting education, research, and training. When the center transitioned into the nation’s first school of philanthropy, Dr. Tempel returned to serve as the founding dean of the Indiana University, Lilly Family School of Philanthropy. Dr. Tempel remained committed to legitimizing the study and teaching of philanthropy throughout his career. Since 1998, he has offered his practical insight and wisdom on the field as professor of philanthropic studies and higher education at Indiana University. He served as first elected president of the Nonprofit Academic Centers Council, an organization dedicated to the promotion and networking of centers that provides education and research on the nonprofit sector. In addition to the academic study of philanthropy, Dr. Tempel was also deeply interested in the ethics of philanthropy. Dr. Tempel served as chair for the Association of Fundraising Professionals’ ethics committee from 2003 to 2005. As a member of Independent Sector’s Expert Advisory Panel in 2007, Dr. Tempel assisted in developing and publishing national guidelines for nonprofit governance and ethical behavior. Dr. Tempel continues to serve on the Expert Advisory Panel. Part of Dr. Tempel’s strength as an educator in the field came from his many years of experience as a fundraiser. Dr. Tempel used his experiences to help create the Philanthropic Services unit at the center, which helped support nonprofits in various areas of need through trainings, workshops, etc. In addition, Dr. Tempel launched the first Women’s Philanthropy Council at Indiana University. He has lent his experiential wisdom by serving on the boards of countless organizations, including the Riley Children’s Foundation, Conner Prairie Museum, Sisters of St. Benedict, Learning to Give, Goodwill Industries Foundation of Central Indiana, Catholic Community Foundation board (founding member), and the Indiana Commission on Community Services and Volunteerism. Dr. Tempel served as the Indiana University Foundation’s president from 2008 to 2012. In 2010, he oversaw IU Bloomington’s $1.1 billion Matching the Promise campaign as well as Indiana University-Purdue University Indianapolis’ (IUPUI) $1.25 billion IMPACT campaign. He completed an evaluation of the IU Foundation and built a strategic plan to help increase total voluntary support by $100 million annually. He was awarded the Henry A. Rosso Medal for Lifetime Achievement in Fundraising in 2012. Over the course of his career, Dr. Tempel has exemplified servant leadership in partnership with professional colleagues in Michigan and across the nation. The A.I.M. Alliance (Arizona, Indiana, and Michigan) was a novel collaborative effort between the university centers on philanthropy at Arizona State University, Indiana University, and Grand Valley State University (GVSU) in Michigan. The A.I.M. Alliance experimented with joint ventures in research, shared teaching of students, and collaborative professional training. Ms. Dorothy A. Johnson (1998–2005, chairman 2001–2002) and Dr. Russell G. Mawby (2000–2006, advancement committee) from Michigan, served on the IU Center’s board of governors. The W.K. Kellogg Foundation funded the launch of the Dorothy A. Johnson Center for Philanthropy in Michigan at GVSU and partially funded the development of the Center on Philanthropy at IU. The philosophy of collaboration was infused in the founding of both organizations. A common interest in educating pre-college students, led to a number of inter-related collaborations. These were joint ventures involving philanthropic leaders in Indiana, with funding from Lilly Endowment, and leaders in Michigan, with funding from the Kellogg Foundation. The Learning to Give project in K-12 philanthropy education, which was led by the Council of Michigan Foundations, received substantial help and guidance from Dr. Tempel and the staff at IU. The Youth in Philanthropy Indiana (YIPI) project in communities throughout Indiana was assisted by philanthropy leaders in Michigan. There remains a high level of trust and cooperation between the two states, a level of trust nurtured by the leadership of Dr. Tempel. Dr. Tempel was interviewed regarding his insights and experiences in working with Michigan’s philanthropic community and the Our State of Generosity (OSoG) partners. The following are selected quotations from his interview specifically related to the five organizing themes of the OSoG project.